Ideal for intra-day/week traders of all skill levels, the method uses both classical & proprietary indicators, which makes it particularly good at finding precise entry & exit points. Indicators & templates built for MT4/MT5 platforms. Lifetime software support / updates. 25+ FX pairs, commodities, indices and cryptos. 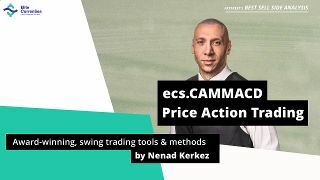 The ecs.CAMMACD method includes 3x trading systems and practical education offered by trader & FXStreet award winner Nenad Kerkez, aka Tarantula FX. The CAMMACD course offers trading education on technical analysis, risk management, trading psychology, and 3 separate trading systems called MTF (multiple time frames for entries on 1 hour chart), London Open Advanced (EA, automated trading at London open), and HTV (high volatility trading). The CAMMACD method is simple, semi-automated, and combines action & ECS indicators. The approach is fully rules based and suitable for traders with all types of experience levels including beginners.It’s ideal for intra-day & intra-week traders and is particularly good at finding precise entry & exit points. The indicators & templates are built for MT4/5 platforms and as a student you will receive lifetime updates. They can be traded on 25+ Forex pairs, CFDs on commodities, indices, cryptos. The system is best suitable for intra-day and intra-week trades and valid for both full time and part time traders. Traders will also receive 3 months access to ecs.LIVE service which offers 24-5 live support with Live setups with entries / exits, daily Forex analysis and more.